As we mention it everywhere on our pages, we at Hrank are devoted to monitoring and measuring as well as analyzing the performance of web hosting providers. We have been doing it for a white, since 2016 namely, and now it’s the time to reveal some statistic data. We have access to all TLDs from the most popular zones and we know where they belong to. We monitor about 40,000 Shared IPs (*where by 1 Shared IP we mean the one containing more than 50 websites) with approximately 50 million websites hosted on them. By means of our software that aggregates and analyses the data we get uptime and response time information. The charts visible on the provider pages depict the average value for the previous 30 days, however, the statistical data presented in this article is offered for the previous 90 days as we wanted to prepare a more representative visualization. 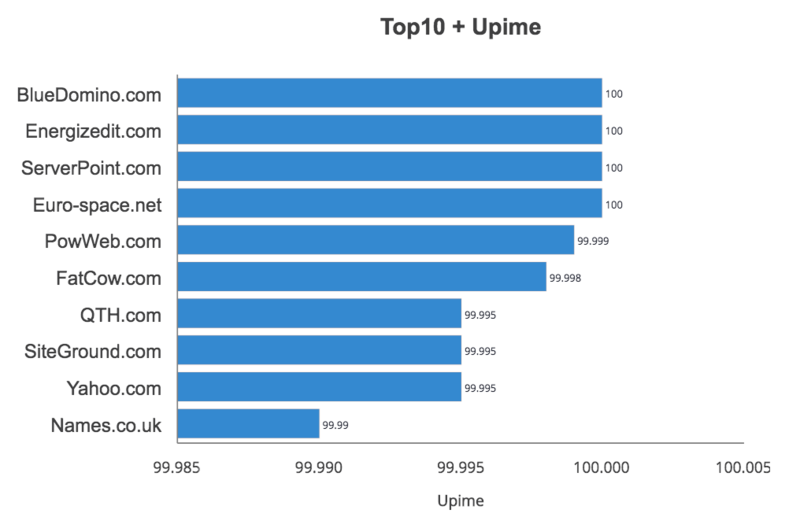 In these four charts we single out top 10 web hosting providers that both have Hrank from 10 to 9.4 and the best uptime / response time / number of Shared IPs / numbers of websites values. Why these very parameters? For one thing, we have selected the best performing providers as we see it our mission to be both objective and at the same time to recommend website owners the best options. For another, we wanted to show that some statistics is not necessarily the most obvious one. So, let’s have a look. Friendly reminder: response time means how long it takes to get a response from a Shared IP and start the the page rendering in a browser. This is not to confuse it with page load speed and the like. 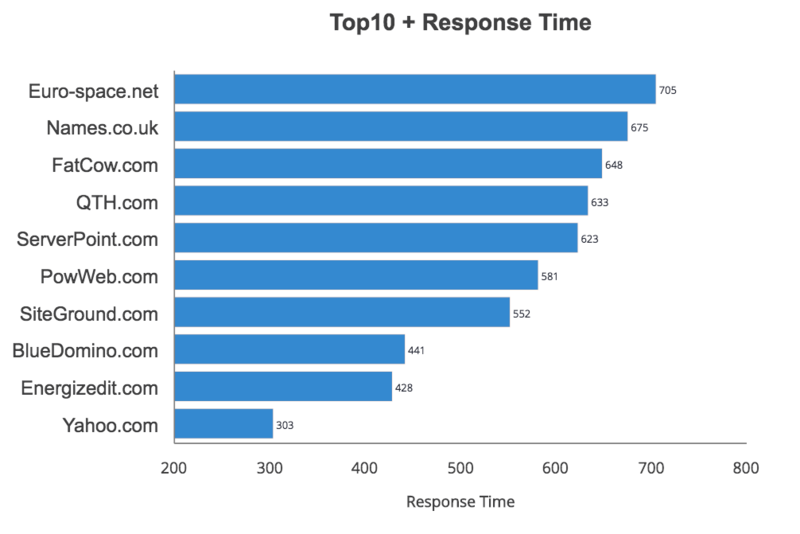 As we can see, some of the most known providers are not the ones with the fastest response. 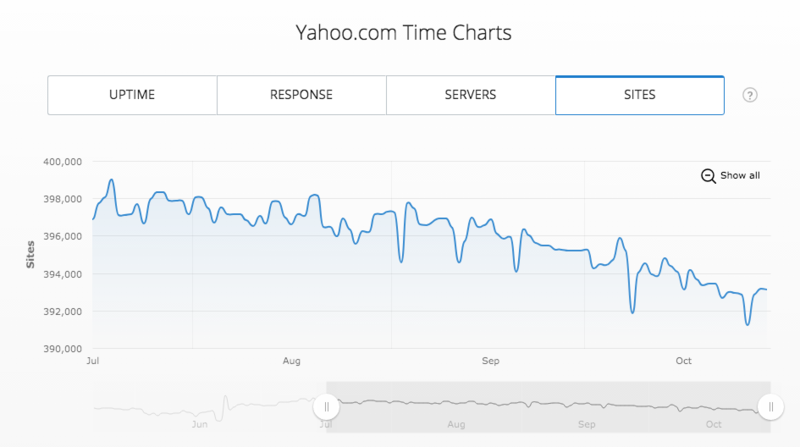 Also, Yahoo.com have appeared quite low in our list. 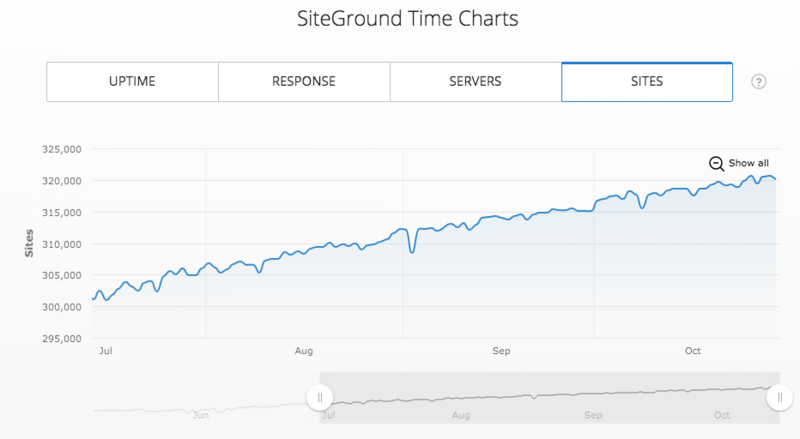 Friendly reminder: this is the quality time when your site is up and running and attracts visitors. Friendly reminder: 1 Shared IP in our understanding contains more than 50 websites. Here we have got only one provider that can boast its numbers. All the rest are being much more modest in this respect. The fact also proves the point that its not just large hostings that have good performance, some of the smaller and less-known ones can be a good choice, too. 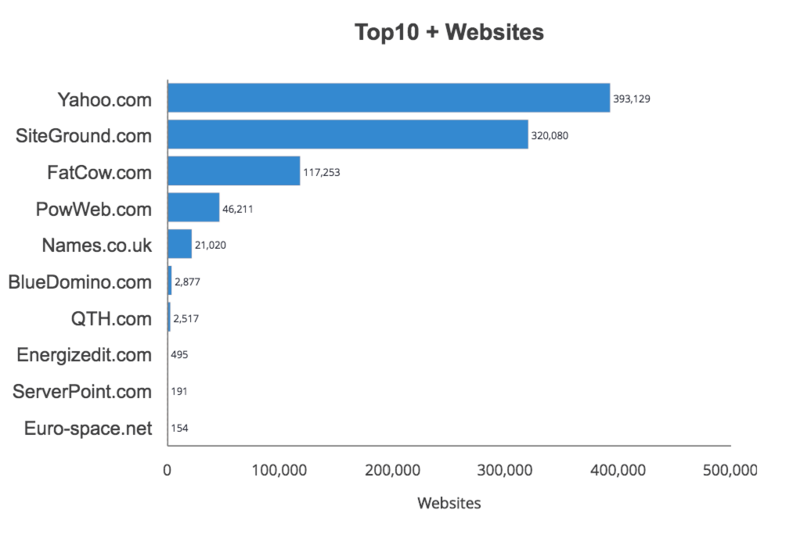 Here most numbers can be expected: most popular providers have the largest number of websites. However, this is a topic for another analysis and a new article. Interestingly enough, the performance results among the top providers vary, and not just among themselves, as we suppose, they will also be news to many readers. 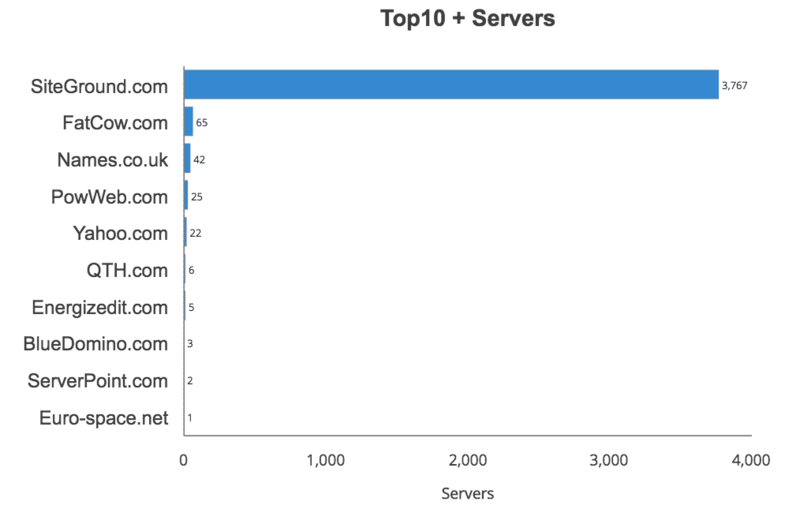 Our charts, as we mentioned, do not depict just the fastest providers and the ones with the best uptime, but also the top ones in terms of HRank. We have expected some of these results (namely that smaller and less-known providers are frequently very capable) and we’re not surprised to be saying that BlueDomino.com and Euro-space.net illustrate the point brilliantly. It’s worth pointing out that several hostings managed to maintain 100% uptime for the monitoring period and by doing so proved their claims. Another important finding of this analysis is about website dynamics with regard to providers, which is mentioned at the end. The topic is really fascinating and worth studying further in detail. We will definitely get back to it later on our blog. We find it most exciting to learn all sorts of things about hositng providers’ performance to get the idea of how their past results correlate with their present ones and how website owners can benefit from this knowledge. Surely enough, these results are subject to change, however, the believe that the present data will be of some use, nonetheless. In the meantime, we encourage you to go and check your provider (if it is in our list), and see how it has recently performed as opposed to the top 10 ones we have covered in this article.